EN - weil's Ihr Urlaub ist! Our small hotel is privately run and offers just 6 rooms. 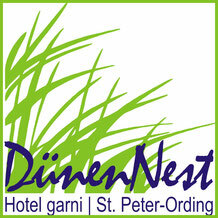 Enjoy our quiet and personal atmosphere, nestled in a quiet and central location in the middle of St. Peter-Ording. You’ll reach the North-Sea dike after a short walk through the picturesque dunes. Spend a relaxing holiday on Germany's longest sandy beach in modern and cozy non smoking - rooms, ideal for 1 or 2 people. In each room you' ll find a kettle with free tea/coffee facilities. Start your day with a generous hot and cold breakfast buffet in our bright breakfastroom or adjoining terrace overlooking the garden. Enjoy fresh orange-juice, eggs, sausages, cereals, warm rolls, marmalade, cheese and typical German cold meats. St. Peter-Ording, which is Germany’s most popular seaside and spa resort, is about 150 km north-west from Hamburg. You will arrive in St. Peter-Ording by train (approx. 3 h from Hamburg) or by car (approx. 1.5 h from Hamburg). The area is ideal for windsurfing and kite boarding. You can also simply relax and enjoy the view of the saltwater marshes, sand dunes and stilt houses. All rooms feature a flat-screen TV, seating area and private bathroom with shower, hairdryer and cosmetic mirror, free tea/coffee facilities and free wifi. Suite with living- and bedroom, 2 flat-screen TV, sofa, free tea/coffee facilities and a private bathroom. Spacious room with flat-screen TV, seating area, free tea/coffee facilities and a large bathroom. On the ground floor with a terrace. Room with flat-screen TV, free tea/coffee facilities, a private bathroom and a balcony. Bathroom with toilet, shower, hairdryer and free toiletries. spacious bathroom with toilet, shower, hairdryer and free toiletries. Check in & check out: Your room is available on arrival from 1pm to 5pm. If you'll arrive after 5pm, please inform us at the latest on your arrival day. Thank you so much! Car parking: Free car parking directly outside the house. Children: Our house is not suitable for children under 12 years. Cancellation policy: A free cancellation or modification of the reservation is up to 14 days before arrival. After that or in case of no-show, 80 percent of the total price of the reservation or modification will be charged. Minimum Stay: Bookings are taken for a minimum duration. Accepted credit cards: Visa, Euro/Mastercard, Maestro, EC-Card.